Come explore our dealership serving Boulder Longmont Thornton Denver residents to discover the latest information on the 2018 Jeep Wrangler. With four models to choose from, you’ll be able to find the vehicle that works best for your needs and activity level. The Sport and Rubicon models are some of our most asked about vehicles, and you’ll have the chance to test drive vehicles on our lot to find the perfect one for your needs. One of the nice things about owning one of our Jeeps is the ability to customize the exterior of the vehicle. You’ll be able to enjoy a Premium Black Sunrider Soft Top, a three-piece hard top and full-metal doors with roll-up windows. Our Denver Buyers Guide is designed to help you get an incredible deal on your next vehicle. Contact Pollard Jeep to find out more about our Jeep offers at our dealership serving Boulder Longmont Thornton Denver shoppers. This vehicle is designed to provide you with incredible capability to tackle the most intense terrain. Choose from a selection of tire options, from 17-inch to 18-inch tires that are designed to provide you with additional stability. You’ll also get your choice of all-season, all-terrain or off-road tires on select models. The Sport S model comes with a Uconnect 3 system with a 5-inch display. The Rubicon model comes equipped with a Uconnect 4 system with a 7-inch display. Standard features include power windows, a leather-wrapped steering wheel and an optional leather-wrapped shift knob on the Rubicon model. The Wrangler also offers the option to get the Alpoine Premium Audio system and a navigation system so you always have the best route at your fingertips. The 2018 Jeep Wrangler near Denver offers an incredible array of features that are designed to help you go farther into unknown territory. If you have a particular interior color preference, you can also choose from three possible interior color schemes. The Wrangler is designed to provide you with the comfort and convenience you need to enjoy your next trip. The 2018 Jeep Wrangler offers a host of options that will help you get more from your vehicle purchase. Come down and explore the 2018 Jeep Wrangler near Denver, Colorado, and find out how you can take this vehicle home for yourself. You’ll get features including rock rails on the Rubicon trim level, and a fuel tank skid plate shield on all models. There is even a standard transfer case skid plate shield to keep your vehicle protected. The vehicle also comes with two front and one rear set of tow hooks to help you get out of tough situations. With a maximum towing capacity of 2,000 pounds, you’ll be able to tow a small trailer or bring along your favorite recreational vehicle on your next trip. Check out the 6-speed manual or8-speed automatic transmission that is designed to help you get a smoother ride with better traction and low-speed manuevering. The vehicle also offers a Command-Trac part-time 4WD system that is designed to help you tackle intense terrain. When it comes to the powertrain, you’ve got a capable and reliable vehicle. You’ll have a few engine options to consider, including a 2-liter turbo eTorque engine that is designed to give you a good mix of efficiency and power. For a more powerful engine, consider the 3.6-liter V6 engine with an optional engine block heater. All vehicles come standard with an engine oil cooling system to keep your vehicle running at maximum efficiency. 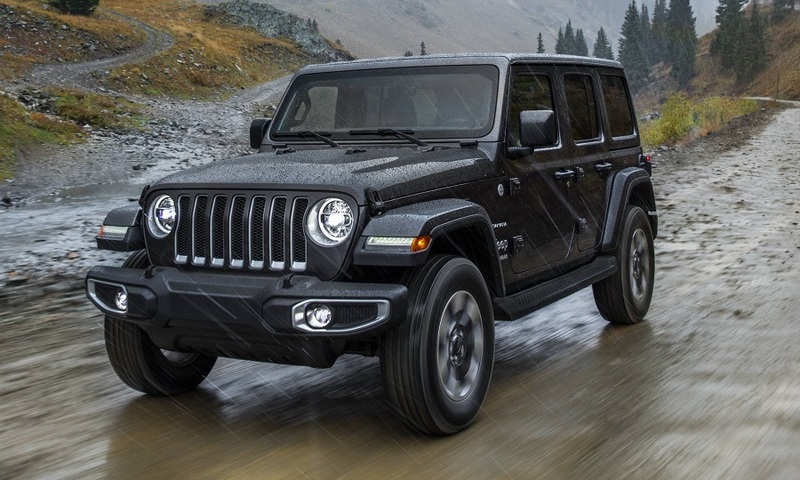 Review our Denver Buyers Guide and contact Pollard Jeep to find out about all of the incredible deals and incentives we have for new Jeep vehicle purchases. The powertrain in this vehicle is designed to provide you with an outstanding level of reliability and control. Plenty of safety features have been included in the latest model to give you good control of your vehicle and maintain a high level of safety. The vehicle comes with standard features, including advanced brake assist, multistage air bags and a front passenger seat belt alert system. The vehicle also comes with electronic roll mitigation, electronic stability control and hill start assist to keep you safe on the road. There is also a hydraulic assist brake booster system to give you exceptional stopping power. For a better view of your surroundings, you’ll get features like the ParkView Rear Backup camera. The vehicle also provides you with extra security in the form of a security alarm, a theft deterrent system and a keyless entry and go system. You’ll also get a tire pressure monitoring system, trailer sway control and traction control to keep you stable on the road. Visit our dealership serving Boulder Longmont Thornton Denver buyers with outstanding deals on our 2018 Jeep Wrangler models in stock. The 2018 Jeep Wrangler near Denver is one of our most highly coveted vehicles, and we think you’ll love our selection. After reviewing our Denver Buyers Guide, make certain to contact Pollard Jeep to find out how you can take home a new Jeep today. Let us help you get into a new vehicle today with outstanding financing and special offers. We will work to help you get the vehicle you want at a price you can afford.